There are many reasons why now is the right time to make the move to Microsoft Exchange Server 2010, including a host of administration and security improvements. However, as with Exchange Server 2007, Exchange Server 2010 requires SSL certificates to ensure the security of all connections to the email server. 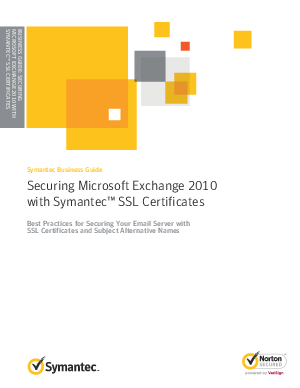 This guide from SymantecT will help you take the guesswork out of implementing SSL for Exchange 2010, making it easier than ever to get the SSL certificate you need for a successful and secure Exchange implementation, and to take advantage of powerful capabilities such as Subject Alternative Names (SANs).